One of the highest ranking Confederate fatalities at First Manassas was Colonel Francis Stebbins Bartow, whose brigade contested the Federal advance on Matthews Hill at First Manassas. During the Battle of First Manassas, Colonel Francis Stebbins Bartow was carrying the flag of the 7th Georgia Infantry when he fell leading a charge on Captain James Ricketts’ battery of Regular Army artillery. Bartow was mourned as a martyred hero, and in September 1861 the site of his death was memorialized with a marble pillar—the first monument erected on an American Civil War battlefield. Born in Savannah on September 6, 1816, Bartow was a talented lawyer, served two terms in the Georgia Legislature, one term in the State Senate, and was captain of the elite Oglethorpe Light Infantry. 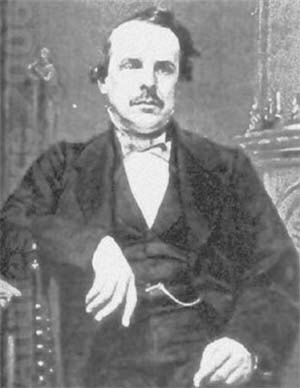 An ardent proponent of Southern rights, he was a delegate to the Georgia Secession Convention and one of three state representatives in the Provisional Congress of the Confederacy. As chairman of the Committee on Military Affairs, Bartow recommended adopting gray as the official color of the Confederate Army uniform. Desiring to serve the Southern cause on the field of battle, Bartow left his political duties and was soon elected colonel of the 8th Georgia Regiment. Placed in command of a brigade in Johnston’s Army of the Shenandoah, he joined in the rail-borne movement to reinforce Beauregard’s forces at Manassas, though only two of his regiments—the 7th and 8th Georgia—arrived in time to take part in the fighting on July 21. Within days of the Confederate victory at Manassas, Southern correspondent Peter Wellington Alexander recounted the dramatic circumstances of Bartow’s death on Henry House Hill in a series of dispatches, excerpts from which appear below. Alexander’s entire narrative was published in William B. Styple’s book, Writing & Fighting the Confederate War (Belle Grove Publishing Company, Kearny, NJ, Spring 2002). “It was when the brigade was ordered to take one of the enemy’s strongest batteries, that it suffered most. It was a most desperate undertaking, and followed by the bloodiest results….The balls and shells from the battery, and the bullets from the small arms, literally riddled the woods. Trees six inches in diameter, and great limbs were cut off, and the ground strewn with the wreck. It became necessary to retire the Eighth Regiment in order to re-form it. Meanwhile, Col. Bartow’s horse had been shot from under him. It was observed that the forces with which his movement was to be supported had not come up. But it was enough that he had been ordered to storm the battery; so, placing himself at the head of the Seventh Regiment, he again led the charge, this time on foot, and gallantly encouraging his men as they rushed on. Tags Confederacy, Confederate Army, First Manassas, France Stebbins Bartow, light infantry, Manassas, Richmond.